Why do I mention this? Because Wednesday is World Read Aloud Day and Eric Carle picture books are perfect for reading aloud. 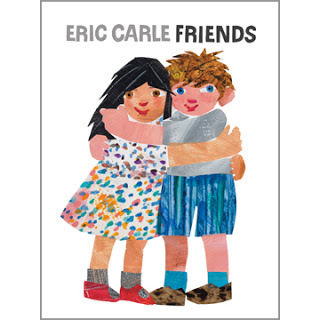 With that in mind, and because today is Perfect Picture Book Friday (over at Susanna Leonard Hill), my perfect picture book choice today is an older Eric Carle story. In the style of The Story of Ferdinand by Munro Leaf, “Slowly, Slowly, Slowly,” said the Sloth celebrates our right to be who we are. Without making excuses, the sloth accepts his personna and embraces it. What a wonderful story for both parent and child to read together…what a wonderful opportunity to talk about how we are each different and how that very diversity contributes to the beauty of the world. The illustrations are bold, a kaliediscope of color collages…exactly what we would expect from an Eric Carle book. The text is simple and effective…and the section where the sloth gives over a dozen synonyms for slow, quiet and boring is fantastic…kids will LOVE those big words: lackadaisical, lethargic, sluggish, languid…oh my, what fun…and learning all the time! The story addresses friendship, diversity, pride in oneself, awareness of one’s own values and strengths. The foreward, by the famous Jane Goodall, relates some of her experiences with sloths in the jungles and rainforests of South America I did not know that sloths sleep nineteen hours out of twenty-four…and that they are basically silent creatures who occasionally comment on life with a small sigh, ‘ah-ee’. Sleeping nineteen hours out of twenty-four…that sounds like a spa vacation to me. Eric Carle is famous for his collage illustrations. Why not do a collage with your child? One piece of construction paper, several pieces of other paper/fabric/tissue paper/giftwrap/newspaper/magazine/wallpaper swatches, glue, scissors, markers or crayons. Let your child decide what the picture will be…a person, a landscape, a jungle filled with animals. Or, perhaps your child prefers to just cut or tear and paste his own design. 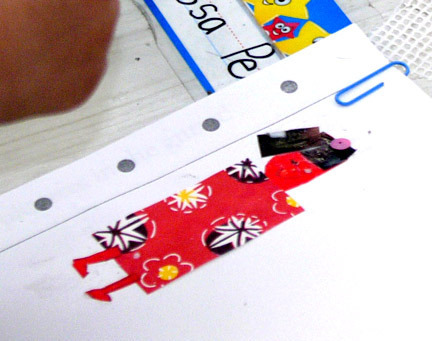 If your child wishes to make a specific picture, he might want to draw the picture on the construction paper first, before cutting or tearing the collage pieces. 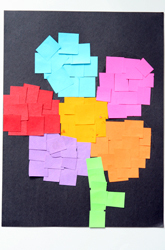 Cut or tear the paper/fabric/newspaper/etc and glue on the construction paper. This entry was posted in Eric Carle, Let's Move Fireside Chat with Michelle Obama, Perfect Picture Book Friday, World Read-Aloud Day and tagged children's author Susanna Leonard Hill, Eric Carle, Lets Move Fireside Chat, Michelle Obama, Perfect Picture Book Friday, Slowly, Slowly said the Sloth by viviankirkfield. Bookmark the permalink. We love Eric Carle books in our house. But, haven’t read this one. Thanks for the heads up and thanks for the feedback at critique group. I’ll send you notes sometime this weekend. Thanks, Stacy! I love our critique group! You left before Jeanine did hers, right? She actually did two…a short one…and a longer one called: ‘Ms. V’s Very Big Trip’…it was hilarious…all about me and my anxiety about going to Singapore…and she even did an illustration! What fun. I’ll bring it to the next meeting so you can see it.Eric Carle is one of my favorite author/illustrators…and reading about him, I found out that when he came here, Leo Lionni was his mentor. What luck! I hadn’t seen the sloth book before!! My new obsession! “Without making excuses, the sloth accepts his personna and embraces it. What a wonderful story for both parent and child to read together…what a wonderful opportunity to talk about how we are each different and how that very diversity contributes to the beauty of the world.” Great lesson for teens too. Thank you, Vivian. Thanks so much, Krista, for stopping by and leaving such a lovely comment. When I first picked up the book, I didn’t realize what a powerful and important message it had. After reading through it, I feel in love with it…and plan to use it for story-time school visits next semester…I’ll bet most of the kids and teachers have never heard it. Gotta love picture books for all ages, right? I’ve always loved his work and art. Love reading these to the grandkids. Eric Carle books are always favorites! That is a great lesson for kids, Vivian. Good luck with the Google+ debate, how fun! I like reading the title aloud, over and over, ever slower! Thanks for recommending this one. I thought I’d read almost all the Carle books – good thing I haven’t! And now he has a new one on the way. :) Remember that Kevin Costner movie, “If You Build It, They Will Come”? Well, I guess with Eric Carle we might say, ‘If he writes it, we will read it.” 🙂 Glad I gave you a new one to enjoy, Julie! 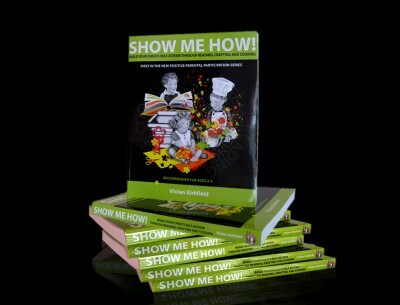 I love th message in this book for kids and adults! And, a great discussion book on acceptance and differences. As always, you have great activities. Eric Carle is such a classic. My children enjoy him as much as I did. That’s what makes a classic, I guess…every generation in turn can enjoy it because it is timely and timeless. Maybe one day we will write those. :) Glad you liked this one, Kirsten. 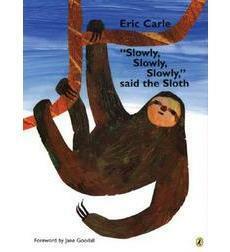 Oh my, I’m an Eric Carle fan and haven’t read this one. Thank you so much for pointing it out to me. Ooooh, fun. I love anything animal, and my daughter did an amazing Eric Carle collage recently. Thank you for sharing this one, it’s now on my reading list! Glad you liked this one, Miranda! Collage is one of those inexpensive, express-your-creativity, I-can-do-it-myself activities for kids of all ages…and obviously, adults as well…as Eric Carle shows us. :) By the way, thanks so very much for the positive and insightful feedback on my Visitors to Deep Pool RYS entry…I shared it with my little local SCBWI critique group and they helped me see exactly what you meant about putting it in stanza format…you rock, Miranda! Wonderful share, Vivian. I really like the message of that book . . . and the collage project. Wonderful message in the book — so important for all to remember. And LOVE all the big words!